The Turkish city of Istanbul has played host to an exhibition of Islamic artworks by Iranian artists, which are based on Persian calligraphy reflecting Safavid motifs. 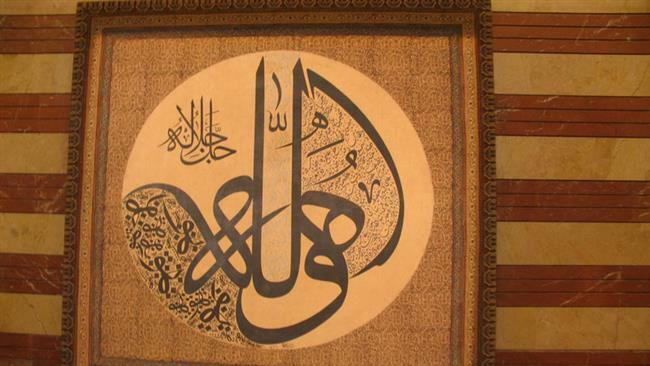 The Turkish city of Istanbul has held an exhibition of Islamic artworks created by Iranian artists. Titled ‘From the Earth to Heaven,’ the event was opened during a ceremony at Istanbul’s Cemal Resit Rey cultural center on July 7, 2015. The opening ceremony was attended by Iran’s consul general in Turkey Mohsen Mortezaeifar and a number of Turkish officials, art collectors and gallery owners. Iran and Turkey have extensive political and economic relations and ‘From the Earth to Heaven’ exhibition can pave the ground for joint cultural and artistic activities, said Mortezaeifar during the opening ceremony of the event. The exhibition, which is being held in six sections, mainly exhibits works based on Persian calligraphy and reflecting Safavid motifs. The main section of the event showcases a number of unique and innovative works of miniature painting and calligraphy created on textile. A group of seven Iranian artists have created the works based on the Baysonghori calligraphy style. The works are recreations of Safavid works produced on a large scale, and with unique and innovative methods. The Baysonghori style is named after Persian calligrapher Jafar Baysonghori, who created a world-famous manuscript of Persian epic poet Ferdowsi’s masterpiece Shahnameh in 1429. Visitors can also see exquisite handicrafts made of turquoise and steel, as well as Persian carpets and paintings featuring Koranic verses and Persian poems. An interesting part of the exhibition includes stucco paintings created based on similar works found at the Chehel Sotoun Palace in Iran’s historical city of Isfahan.